The recent snow interrupted our usual Spring Into Health Week, meaning we couldn’t bring you all the fantastic offers we had scheduled for the Thursday, Friday, and Saturday. But not to worry – because we’re bringing them to you from Thursday March 22 to Saturday March 24 instead! All bookings for treatments and therapies we took for the original dates will still be honoured. There are still some other slots available too – phone us at (053) 9236009 to enquire. And don’t miss our daily specials! There’s up to 50% off some of your favourite products each day, and lots more great offers too. That’s all with free expert advice, free consultations, and the best service all round to get you living more healthily and feeling better. Click on any of the single images below to see the offers for that day, or view or download a PDF of our brochure using the button underneath. Also keep an eye on our Facebook page for more details as the big event draws near. 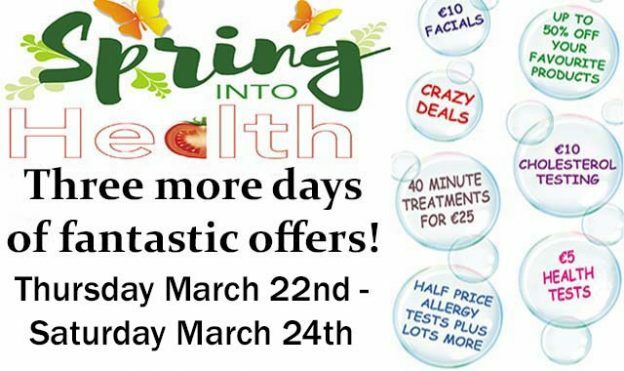 And if you want to avail of any our special offer treatments or therapies, don’t forget to book by calling (053) 9236009. We’re looking forward to our Spring Into Health Three-Day Event. We look forward to seeing you then!